Every year I get to this point where I need to do a Tinsel & Tine end of the year movie round up and then I say to myself "What have you been doing all year?" Because, there's always so many movies I didn't get to see or saw but never wrote about. This year I felt my Golden Globes nominations post would suffice as an end of the year wrap up, and then Half Popped asked their reviewers to participate in an online awards by submitting our votes for movies of 2014 in various categories. Not familiar with Half Popped? It's a site somewhat similar to Rotten Tomatoes where you can get and give movie ratings, weigh in on top 10 lists, and check out movie reviews from several sites - mostly film bloggers. Most Enjoyable Movie of 2014 – maybe it wasn’t of the highest quality, but you enjoyed it the most. 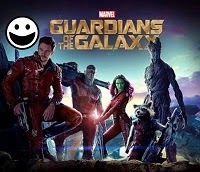 I've gotta go with Guardians of the Galaxy - It's a hoot! Deliciously off-beat and sardonically witty, laugh out loud funny at times without it trying too hard to be comedic. Good for Chris Pratt for surprising everyone with his leading man capabilities. His Star-Lord is just the right blend of assurance and idiocy to lead this band of oddities which includes an egotistical bounty hunting racoon and his soft-hearted, wooden sidekick Groot. Hands down Selma, not only for its timeliness in the wake of all the protests. And not only because I've been following director Ava DuVernay's career for nearly 5 years and now have interviewed her twice, first for her film "Middle of Nowhere" and just last week for Selma (post coming soon), but it's actually a beautifully crafted film and compelling drama. Gozilla. There really wasn't much to appreciate about this movie other than the extraordinary production value and the authenticity of the monsters. 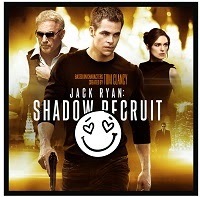 Most Surprisingly Good Movie of 2014 - perhaps you had low expectations of a movie before you saw it, and then it surprised you with its quality or enjoyment - Jack Ryan: Shadow Recruit - Chris Pine is one of those good looking guys who doesn't take himself too seriously. He's a real crack up as Prince Charming in Into the Woods, and that same self-effacing attitude is what makes him shine in this Tom Clancy based spy thriller. The movie really gets going once Ryan goes from being an undercover analyst for the CIA to reluctantly being operational in Moscow; using his relationship with his love interest Cathy (Keira Knightley) as part of the cover. Transcendence - Everyone always thinks of Johnny Depp as being very successful, but he's had more than his fair share of total bombs at the box office and this may be his bombiest. I loved the concept of this movie full of seemingly plausible, brilliant scientific theories and possibilities, a Sci-Fi power couple, near apocalyptic, world changing implication... but it goes no where, nothing happens, even the locations and sets are boring. It's a complete dud. Best Adaptation of 2014 whether it’s a book being converted to the screen, a comic book brought to life (even through animation), biography or remake/reboot, which was the best of the year? The Fault in Our Stars- I haven't read the book, but it seemed those who did were pleased with this adaptation of John Green's best selling novel. The film has great timing and beats and somehow, even though it deals with disabilities, cancer, falling in love and dying young, the film manages not to be schmaltzy, overly dramatic, soap opera-ish or cliched. Worst Adaptation of 2014– not all of the adaptations are a hit. Which one was the least enjoyable? Winter's Tale - I hear Mark Helprin's novel of the same name is brilliant! Full of not just magic, but pathos and layers and mysticism. Winter's Tale the movie seems to put all of that in a blender on puree and pours out some grayish/green pulpy mess. Best Sequel of 2014 – people love to say that Hollywood doesn’t produce anything original these days, but some of them were really entertaining. Captain America: The Winter Soldier- I didn't see the original Captain America: The First Avenger, because all that World War stuff turns me off. But in trying to keep up with the Marvel Universe, I decided I'd better see the sequel. So glad I did! It's got a solid script, they found a smart balance between alluding to Steven Rogers a.k.a Captain America's history and allowing the audience to totally jump aboard this movie without having seen the first one.Then I went back to watch The First Avenger and hated it. I think I only like superheroes in present day or the future. Worst Sequel of 2014 – not all of the sequels were great, so this is where you get to sound off about which was your least favorite? Horrible Bosses 2 - I didn't see it, but blog contributor Misha Revlock did and hated it. I didn't remember the original doing well enough to have warranted a sequel. it is the psychology behind the movie that really draws us in. No Good Deed - I so wanted to love this movie staring Tarji P. Henson and Idris Elba, but there was no psychological suspense or interesting tension whatsoever. So instead I'll give you 3 honorable mentions: Belle personally spoke to me. I. Origins was really unique and metaphysically thought provoking. The Drop a slow build, but by the end you realize the deliberate pacing was genius. Tom Hardy's character is wonderfully complex to be so seemingly simple. Oscar Nominations have been announced "SELMA" is nominated for best picture, but NOT Ava DuVernay (director) or David Oyelowo (Best Actor) - this is a travesty! There's nothing special about the direction of either Morten Tyldum's "The Imitation Game" or Bennett Miller's "Foxcatcher". And nothing noteworthy about Benedict Cumberbatch as Alan Turing. I do think it was important to tell Turing's story, but Cumberbatch just did an adequate job, nothing like Oyelowo embodying Dr. King in every way!